I hope you are all doing well and finding the best on this Wednesday. Not much going on with me, other than work and life. Pretty busy this week. Which brings me to say I am sorry I have not had the time to check out all of your creative and inspiring blogs, I will get back to them hopefully soon. Here is an image of something I adore. The swaying palm tree. I hope you are all having an amazing day. Someone must be doing something interesting . . . . do share. You know, as if we were all around a campfire on the beach. Ha! Glad all is well there! You lied. Those palm trees certainly don't appear to be swaying at all. 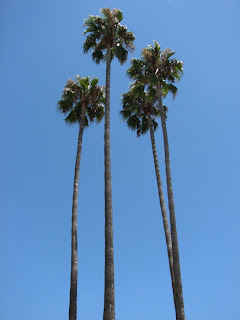 I love those plam trees in LA, too! laurie, - they are quite tall, eh? I was on the ground when I took the photo. michael guy, - oh I love to visit Palm Springs too. Lat in the sun, have an attractive someone serve you drinks and call it a day.